Definition of Soyal Solstice Ceremony: What is the Soyal Solstice Ceremony? The Soyal Solstice Ceremony is also called the Great Feast of the Winter Solstice and is celebrated by the Southwest Pueblo, Zuni and Hopi tribes of Native Americans. The Soyal solstice ceremony is held on December 21 which is the shortest day of the year in the Northern Hemisphere and marks the Winter Solstice. The purpose of the Soyal ceremony and ritual is to bring the sun back from its long winter slumber. The Soyal Solstice Ceremony is a major Hopi ceremony which is celebrated over a period of 16 days which starts with prayers and supplications and ends with a feast and Kachina Dance. The Native American name for this important ceremony is 'Soyalangwul' from which the term 'Soyal is derived. The Pueblo Indians depended on accurate predictions of major astronomical events such as a solstice or equinox to allow them to prepare for important ceremonies, dances and rituals. The task of making accurate astronomical events, such as the summer and winter solstice, was assigned to the Sun Priest called the 'Cacique' by the Pueblo or the Pekwin by the Zuni. The Southwestern Pueblo, Zuni and Hopi tribes celebrated the Great Feast of the Winter Solstice, the Soyal Solstice Ceremony, to turn the sun back toward its summer path and renew the life stages for the coming year. The Hopi and Zuni believe that the sun god has traveled the furthest distance from the tribe at the winter solstice, so warriors and other powerful members of the tribe were tasked to entice the sun back. They therefore performed Kachina dances as part of the Soyal Solstice Ceremony. A Kachina was powerful being or spirit who, if given due veneration and proper respect, could use their powers for the good and well being of the people, bringing rainfall, healing, fertility, or protection. There are more than 400 different types of kachina in the Pueblo culture, each holding different powers and influence. Kokopelli is the most famous of all the Kachina spirits. 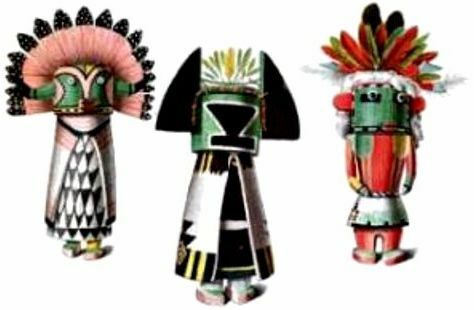 Kachina spirits are represented by dolls and emulated at ceremonies, called Kachinas, in which the participants wear masks and highly colorful costumes. The Great Feast of the Winter Solstice, the Soyal Solstice Ceremony, is a typical Kachina dance and ceremony that acknowledges the success of the Soyal Solstice Ceremony and shares its blessings with all of the community. The first kachina to appear is Soyal depicted as a shabbily dressed figure who totters along in the movements of an old man. Kachina ceremonies are prepared with great care. The Kiva is a special sacred building, often built underground, in which the Peublos prepare for the kachinas including the Soyal Solstice Ceremony. The Kiva is symbolic of the fourth world, the home of the Kachina spirits. Prayer Sticks were prepared in the Kiva and used for various rituals, including the Soyal Solstice Ceremony, for calling forth spirits in the evocation of a prayer. Seasons are marked by the the turning of the sun on the solstices. The winter solstice has been marked as a time of great importance since the ancient times. The winter solstice signifies the the birth of the new year and the beginning of Winter. Many ancient ceremonies acknowledged the winter solstice including Yule, Christmas and Saturnalia which all occurred in mid December. The ancients were hunters and farmers and the seasons and weather played a vital role in their lives. Winter was often harsh and many people did not survive the winter season. Ceremonies and rituals such as the Soyal Solstice Ceremony were observed as a time to make offerings, prayers and powerful supplications to the spirits for protection. At the summer solstice, the sun rises north of East, its most northern point on the horizon. At the winter solstice, the sun rises south of east at its most southern position on the horizon. The Pueblo Indians have two cycles of ceremonies, the summer dances and the winter dances, that are performed to coincide with the Summer solstice and Winter solstice. The purpose of the summer solstice dance ceremonies is to bring rain for germinating the corn crops. The Soyal Solstice Ceremony is a supplication to the sun but other winter solstice dance ceremonies, such as the Buffalo and Deer Dance, are strongly associated with hunting, in which the Pueblo harmonize with the animal world by imitating animals in both dress and movement. Many of the dances feature kachinas, or the Pueblo clowns or Tricksters, called Koshare that are believed to be the spirits of the dead and as departed souls have the ability to intercede with the deities in behalf of the living. The equinoxes were less important than the solstices to most Pueblo cultures and not celebrated to the extent of the solstices. At each equinox, the Sun rises on the horizon due East and sets due West.